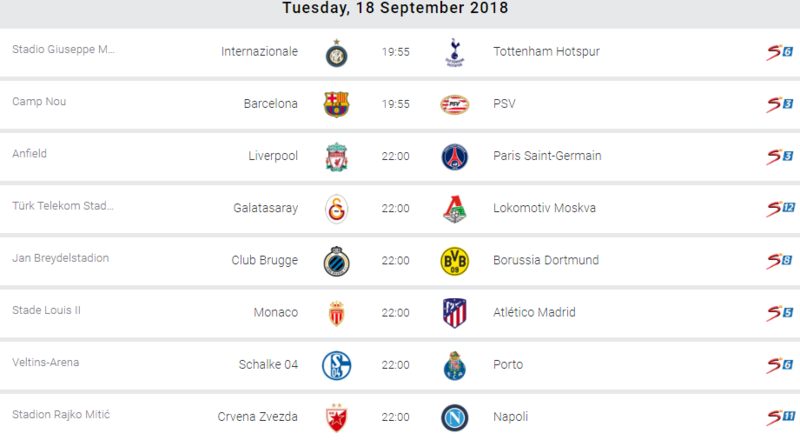 A catalogue of mouthwatering epics lie in store when the world’s most famous club competition, the European Champions League, gets underway on Tuesday, September 17. Of the sixteen match ups across Europe, none promises more fireworks than the Anfield clash between last year’s losing finalists Liverpool and French moneybags Paris Saint Germain. Since German coach Jurgen Klopp took charge at five-time European champions Liverpool, they have been to three finals and lost all of them; most notably failing to play their A game in last May’s final in Kiev, Ukraine where they fell 1-3 to record champions Real Madrid. Klopp faces a familiar foe in PSG manager Thomas Tuchel. When Klopp chose to test his coaching prowess across the English Channel, his compatriot was his successor at Borussia Dortmund. Tuchel himself has been hired by the Qatar Sports Group which owns PSG to help translate their undoubted immense potential into European silverware. Liverpool have begun their domestic campaign like a bullet train; winning all five of their top flight fixtures for the first time since 1990. The Kop’s dominance in a one-sided victory over Tottenham Hotspur is a perfect tonic for a clash with one of the continent’s most lethal strike forces. PSG themselves have had a stellar start to the Ligue 1 campaign. On Saturday, Tuchel’s side brushed aside Saint Etienne to maintain their one hundred percent record. Tuchel did not even need the services of World Cup winner Kylian Mbappe and the world’s most expensive player Neymar Jr as Edinson Cavani, Angel di Maria and substitute Mousa Diaby helped themselves to goals. The race for goals between Liverpool’s fabled front three – Roberto Firmino, Mo Salah and Sadio Mane; and Mbappe, Neymar and Cavani portends a Champions League classic. Spanish clubs Real Madrid and Barcelona once again start as favourites as they have won seven out of the last ten Champions League crowns. Record 13-time winners Real Madrid have especially been dominant in recent years as they’ve won the tournament in four out of the last five seasons. On Wednesday, Julen Lopetegui’s Los Blancos begin their title defense against last year’s semifinalists AS Roma at the Santiago Bernabeu. It is the first time in a decade Real Madrid are without tournament top scorer Cristiano Ronaldo, who left for Juventus last July for €100m. Another notable absentee is French legend Zinedine Zidane who last May became the first coach to win three successive Champions League crowns. Ronaldo’s new employers, Juventus, are away at Spain’s third representatives Valencia. The five time Ballon D’Or winner opened his goal scoring account in a 2-1 Serie A win over Sassuolo but his team will need to improve tremendously to cope with a Valencia team featuring rejuvenated Italian striker Simone Zaza and Spain front man Rodrigo. 2006, 2009, 2011 and 2015 winners Barcelona were unconvincing in beating Real Sociedad in Liga Santander on Saturday night but should improve in time for the visit of free scoring Dutch champions PSV Eindhoven. Meanwhile, Spain’s fourth rep, Atletico Madrid, are away to Leonardo Jardim’s 2017 losing semifinalists Monaco. 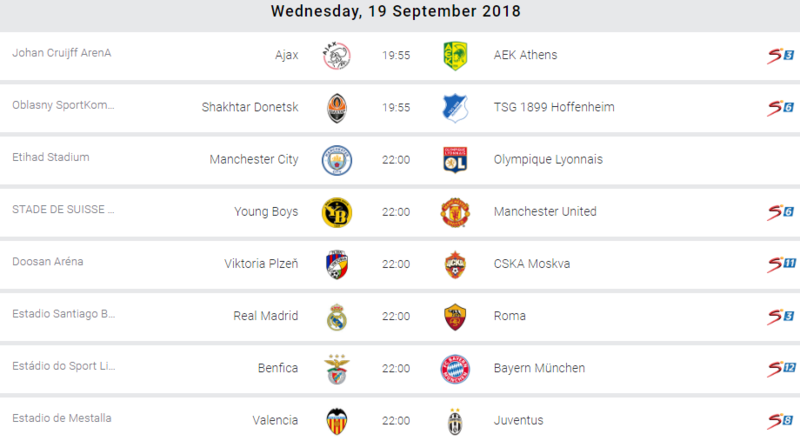 Other attractive fixtures to look out for include 1999 and 2008 champions Manchester United’s trip to Switzerland to face Young Boys; 2010 winners Inter Milan’s clash with Tottenham Hotspur at the San Siro; the contest between 2001 and 2013 champs Bayern Munich and twice European champions Benfica, and Manchester City’s home game with French side Olympique Lyon.